Perhaps the only thing stranger than dropping a small block Chevy in an relatively unloved mini-SUV is the fact that more than one person has done it. Stranger still is the fact that two owners of vehicles that fit the aforementioned description have decided to unload their unique Isuzu Amigo and Geo Tracker on Ebay at the same time.We were entertained enough with the prospect of finding one mini SUV with a V8 when we came across it last week, but finding two was like hitting some kind of bizarre top heavy Chevy powered lottery. 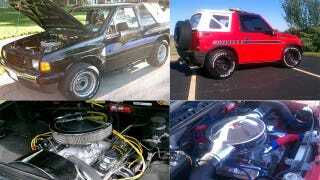 The first mini-SUV V8 combo we came across was this 1995 Geo Tracker. Where there was once a small and not so powerful engine is now a larger and slightly more powerful 283ci Chevy. The listing is short on engine specifications besides the fact it currently has a mild cam (don't worry a "lumpy" cam is also available). The listing does explain the Tracker now has a dual exhaust, a GM 700R4 automatic transmission and it is "loaded with hot rod bling". Contestant number two is a 1993 Isuzu Amigo. This Isuzu lost its four cylinder engine in favor of a 383 stroked Chevy V8. Exact power specs on the engine aren't included but it has the internals of engine capable of making some legitimate horsepower. Other fun features of the Isuzu are 4.10 rear end gears, 4 wheel disc brakes, and the custom lowering job on the body (no further details on that one). We don't know exactly what motivates someone to go through the hassle of swapping a V8 into an Amigo or a Tracker, but to us it is the kind of effort that must be applauded even if it isn't completely understood. If you want to take the easy way to V8 powered mini SUV ownership either of these custom trucks can be had for right around $7500, but you better hurry—both auctions end tonight. More power and sillier side graphics make the Isuzu a fairly easy choice between the two for us, which one do you prefer?